Do you think of yourself as creative? How many times have you said, or heard other people say “I'm not creative”? This mindset is very important to many aspects of our lives and reaches far beyond just the motivation to pick up a paintbrush. As a life-long engineer and maker, I am often struck by a common reaction of "I could never to that" and "I'm not creative" when I show people the wonderful things that are being done in our school and community makerspaces. Encountering this attitude has led me to a series of explorations and readings that have coalesced around a common theme: the mindset of a maker. I think one of the best explorations in this area is David Kelley's popular TED Talk "How to build your creative confidence.” He talks about how kids can shut down creatively around nine years old when someone tells them they are not artistic or creative and how they work to overcome this at IDEO and the Stanford D-school using the Design Thinking framework. Design Thinking fosters curiosity, asking questions, delving into the why and how of a situation in order to develop empathy and understanding from which to start ideating potential paths forward. Equally important, the Design Thinking approach is about iterating and experimenting to find a way towards a solution. This iterative, try-it-and-see approach, builds creative confidence—taking small steps, gaining mastery, and proving to yourself that, in fact, you are creative. Linking to these ideas, Tony Wagner discusses the mindset of successful innovators in his must-read: "Creating Innovators." Innovators exhibit essential qualities such as curiosity, collaboration, associative or integrative thinking, and a bias towards action and experimentation. These themes run very close to the Design Thinking approach, and I am encouraged because it all starts with curiosity. While people may not immediately think they are creative, I think everyone can be curious: I see it and experience it all the time in our after school program, summer camps, and classes. So, to me, the path forward is to take that seed of curiosity, foster it, and grow it so the curiosity will lead to wonder and to ideas that start the wheels in the brain turning. Maker empowerment: a sensitivity to the designed dimension of objects and systems, along with the inclination and capacity to shape one’s world through building, tinkering, re/designing, or hacking. The sensitivity to the design dimension of objects and systems comes from curiosity, of thinking about how an object came to be, what the designer thinking when they designed it, what function were they trying to perform with the object. From those thoughts we can start wondering about how to do something differently, and there is the seed of creativity. 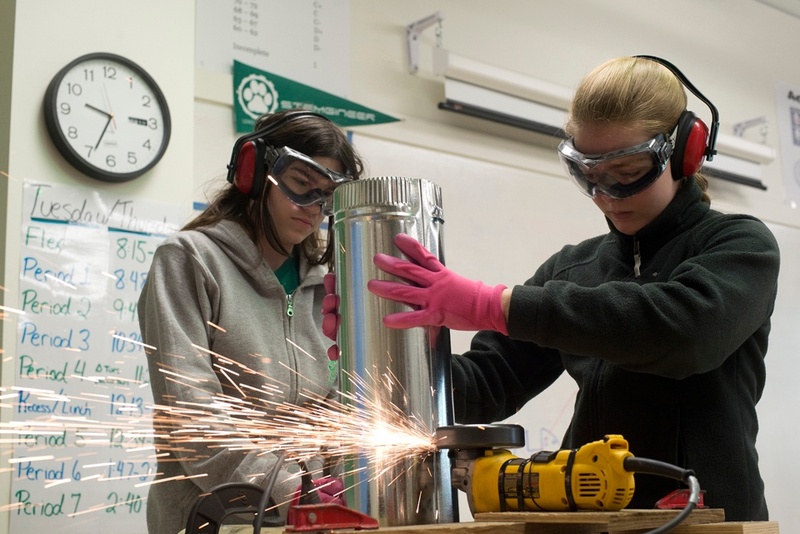 The concept of maker empowerment is so, so important for ourselves and our children. It is linked to the vital concept of agency, which refers to the subjective awareness that one is initiating, executing, and controlling one's own volitional actions in the world. Agency is also a crucial component of hope, which is a bigger predictor of who will finish college than SAT or ACT scores, according to a recent article in the Wall Street Journal. This really gets me excited: when we ignite that spark of curiosity in people (both adults and kids) and give them the design thinking and maker tools to solve problems; then, we foster a whole range of positive outcomes that are life long. Developing the mindset of a maker is teachable. The awesome team at Lowell School know this and have embedded it throughout their programs, but as adult and parent role models for our kids, we should think about what we are doing to develop our own maker mindset. If you are curious, then you can be creative. Give it a go. Catylator Makerspace is a space for creation in design and technology—offering its resources through educational workshops and co-creational space for teens and adults. All located right in the heart of downtown Silver Spring, MD.